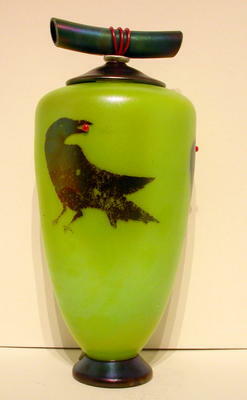 Fields & Fields Blown Glass is a personal and professional marriage of two unique and accomplished glassblowers. By combining their talents, the dedicated couple creates a harmony of style and form. 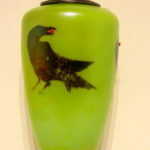 Their singular and successful enterprise is the result of merging two art glass studios into one. 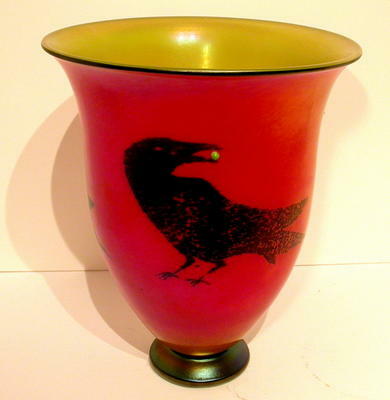 John Fields became fascinated with glass in the early 1970’s while studying business at the University of Arkansas. “I took a stained glass course to alleviate some of the boredom. I made a sun catcher and was hooked.” On his own, John studied the work of Louis Comfort Tiffany and fabricated reproduction stained glass windows and lamps for a growing following. Realizing that his future lay in an art form over 2000 years old, John took a glassblowing class at Pratt in Seattle. 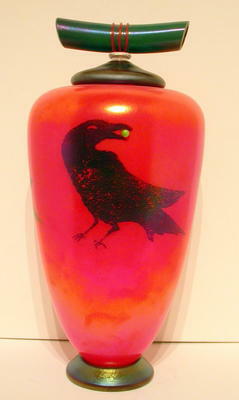 Heather graduated from Virginia Commonwealth University’s School of the Arts in 1986. “I wandered into the glassblowing studio one day and there was no turning back. I was fascinated with molten glass.” After graduating, Heather worked at the Jamestown Glass House in Colonial National Historical Park, demonstrating off- hand glass blowing to park visitors. Because Heather and John shared a workspace their individual ways of seeing things began to show the influence of one another’s work. A harmonious product line emerged. “We were more successful as a team than as individual studios”, relates Heather. Our relationship evolved, creating Fields & Fields Blown Glass.